Looking for a wild experience for your students? 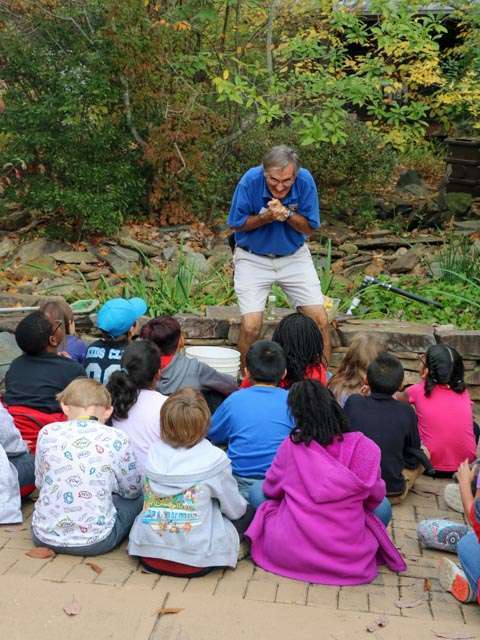 The North Carolina Zoo offers a variety of engaging educational programs for school groups visiting the Zoo. These programs enrich student learning about animals, the need for healthy habitats, and the actions they can take to help protect and preserve Earth’s natural resources. We offer programs for both classes (30 or less people) and assembly size programs (up to 200 people). These programs last 30 - 45 minutes and cost $60 each. These programs are designed for a maximum of 30 students. Explore the Gorilla habitat and learn about the special features and social structure of these gentle giants, their unique adaptations and the role the North Carolina Zoo is taking in helping to protect these amazing animals. Come explore the Chimpanzee habitat and see the members of one of the largest chimpanzee troops of any United States zoo. Learn about chimpanzee behavior, how they communicate, and the current status of this remarkable species in the wild. Elephants and rhinos are some of the most popular animals at the North Carolina Zoo. This program is given at the Watani Grasslands Reserve which is one of the largest habitats at the Zoo. Students will have the opportunity to see what makes African elephants and southern white rhinoceroses so remarkable. How can you tell if it’s a seal or sea lion? How do polar bears stay warm? Learn about the animals that call our Rocky Coast habitat home. If you have a large group, Assembly at the Zoo programs are available. These are themed around animal adaptions and are 50-60 minutes in length. If weather permits, there are also live animal ambassadors encounters integrated. There is a minimum of four weeks notice for any Zoo to You programs and full payment is due at least two weeks prior to the scheduled program date. For further information or to schedule a program for your school, contact the North Carolina Zoo's School Programs Office 336.879.7718 or toll free 1.800.488.0444 ext. 7718, or email. Our educator resources have ideas for both classroom and Zoo field trip activities for students of all ages focusing on wildlife, plants, and their natural habitats. We provide unique and fun learning opportunities for non-school groups and organizations through our Ed-Zoo-Cation programs.